We have completed our fourth week without pizza, are down a few pounds, and generally feeling like we are eating healthier. My jeans fit better and I had to throw out a pair of hiking pants that threatened to fall down. Despite the heat, we had a remarkable 95,000 steps on the pedometer for the week. Bravissimi noi! Antica Taverna has a special place in our hearts and stomachs. We celebrated Thanksgiving there in 2012 and 2014, We’ve dined there for Christmas Eve four times, and twice on New Year’s Eve, plus about once-a-month year-round. 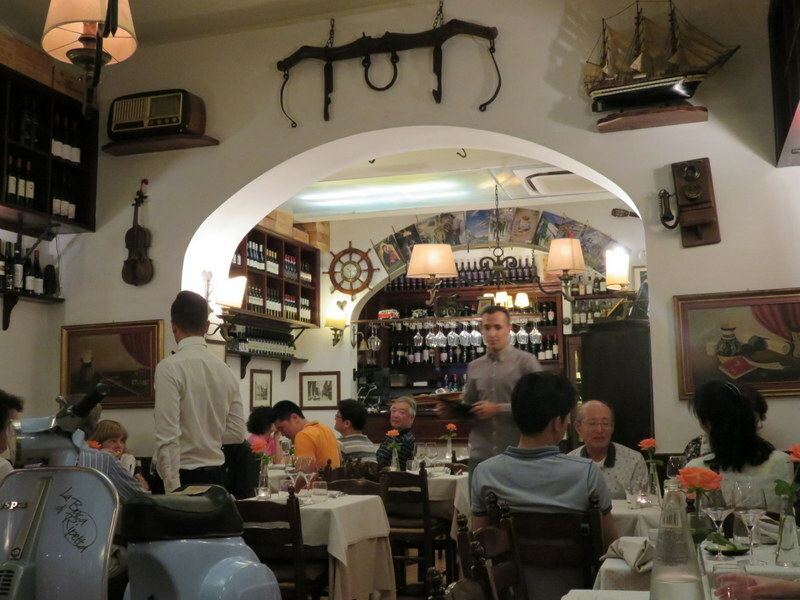 It’s in the Good Day Rome Guide to Restaurants and we take most of our visitors there. We like the place. A lot. It’s like going home when we go to AT. Antica Taverna’s golden glow. It’s away from the Piazza Navona hordes so you have to want to find it. We were turned on to AT during our first trip to Italy, long before living here was even a thought. Being completely exhausted from touring all day, for two nights we dragged ourselves to an enoteca a stone’s throw from our lodging, Cul-de-Sac. A Canadian couple seated next to us said we should venture a bit farther to this place. They could not remember the name of it, but directed us, in very Italian fashion, to “Go down this street to the scaffolding and turn right. You can’t miss it.” That scaffolding guided us for almost two years as we returned in 2011 and 2012. 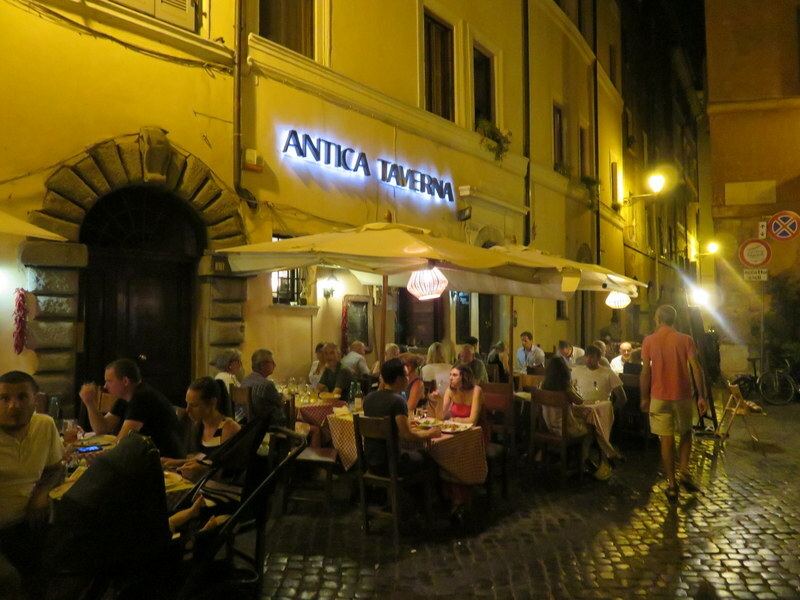 I won’t go into all the facets of the story that have endeared us to Antica Taverna but the staff is very kind, the owner gracious, the atmosphere relaxed and happy, and they serve good Roman food at a fair price. When you dine there often, you get a sconto for being a friend and often a complimentary focaccia. Love it. Just a few diners enjoying the soft August night. 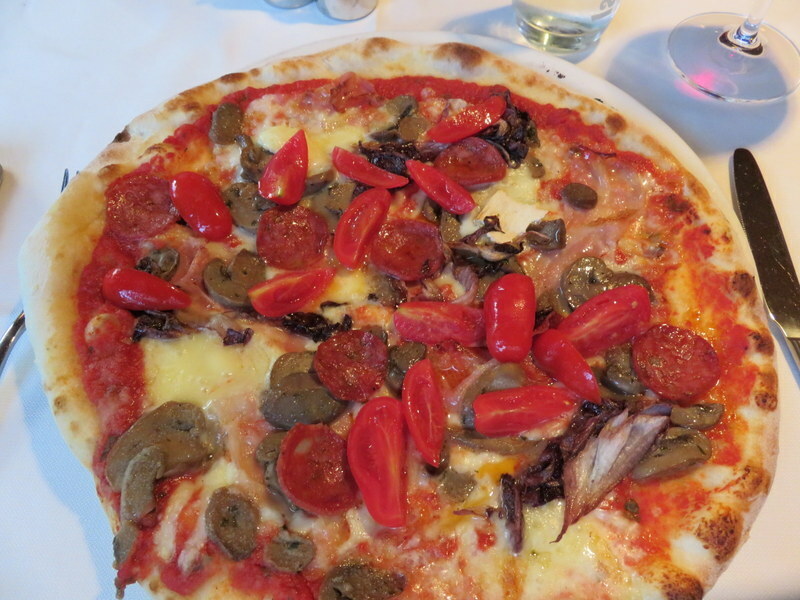 So this week’s pizza substitute was a meal at Antica Taverna. We asked Giovanni (our personal waiter and the restaurant manager) to hold the focaccia. “Siete in dieta?” he inquired. “Sí, meno carboidrato.” (Are you dieting? Yes, low carbohydrate.) We started with prosciutto and melon (hey, those are healthy carbs!) and moved on to our generous secondi of roasted lamb and roasted chicken. A bottle of house red washed it all down. The price was about what we pay for pizza, wine, and fritti at Taverna Rossini. Over the years we have drifted to favorite dishes. Mine is the melanzane al forno (eggplant parm to Americans), which is made without any breading in Italy. But we had been eating eggplant at home all week, so I needed a little chicken. Ric loves the trippa (tripe), which I suppose he could have on a low-carb plan as it’s all protein. The lamb is good, the duck when they have it is excellent, and I love the sauteed mussels. When we dine with more people we like to order the sharable antipasto della casa which is an array of cooked vegetables accompanied by cheese and salume. It’s not on the menu; you have to know about it. We insiders know these things. At Antica Taverna si mangia bene ma costo meno (one eats well but it costs little). My roast chicken was done to a turn! So flavorful and juicy! I could not even eat it all, so Ric helped. The picture looks like the dog’s breakfast, but Ric’s lamb was a generous and tender joint. We left most of the potatoes. We also ate cicoria ripassata. AT has a special room for overflow and larger groups. Tonight it was empty, but we’ve had for a larger group ourselves. We did not suffer for lack of pizza, but we might break our diet on Thursday when we are scheduled to meet friends at another favorite place, Dar Poeta. Watch for a review. La Buca means hole, and can even refer to a subterranean trattoria, but La Buca di Ripetta (literally “the hole in Ripetta Street) is a far cry from a “hole.” We average dining here about once-a-year. We should come here more often. It is very close to the lively scene at Piazza del Popolo, but down a quiet street. Small, reservations usually necessary. Intimate yet not dull, lovely service. 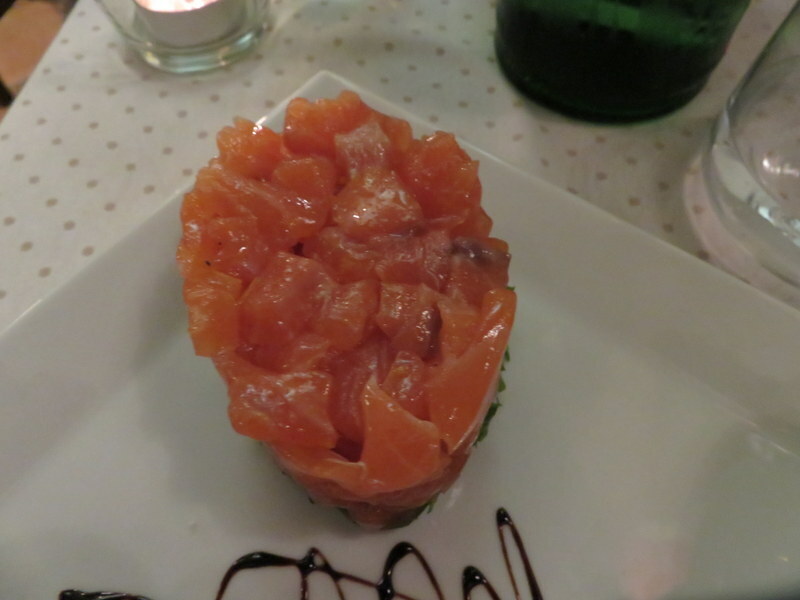 One of four antipasti in our selection, salmon tartar. Silky and delicious. We started with an antipasto misto of four items, but we ate two before I remembered my mission to capture the dinner for the blog. Avoiding the bread basket while quaffing sipping our wine, we were hungry! The butterflied shrimp were divine, and because there is never enough octopus, we had carpaccio. The two remaining items, pictured here, we practically fought over. 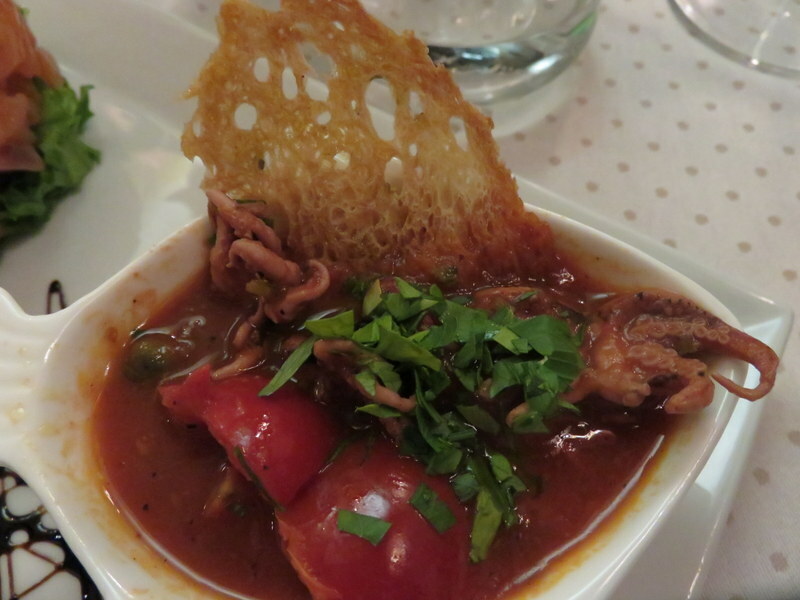 Moscardini in umido (baby octopus in sauce), another antipasto. We made short work of the lovely butterflied shrimp before I remembered to take a picture. 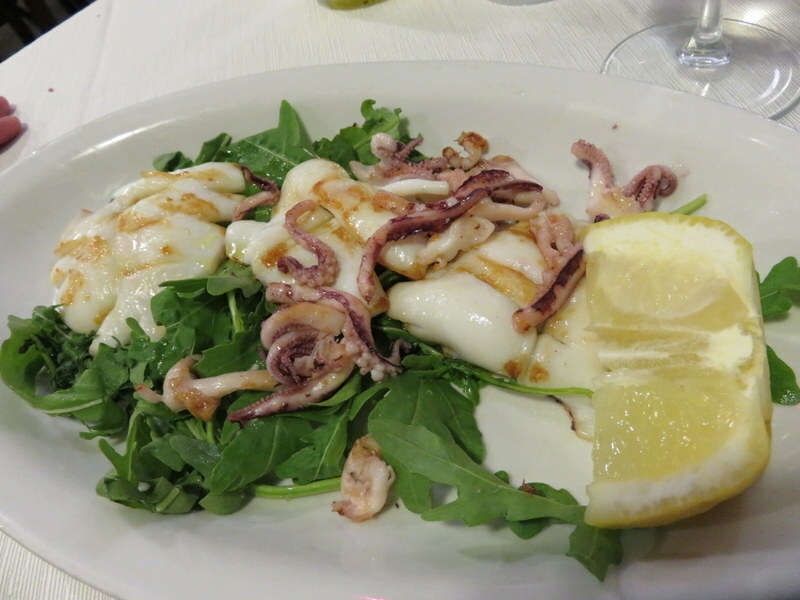 Moving on to our main course, having two preparations as an antipasto was not enough, so Ric ordered the grilled tentacles. How we will miss these options when we come back to the U.S! If you know of a place in the U.S. that does a great job with octopus tentacles — NOT deep fried — please comment! My Saltimbocca alla Romana was classically prepared and did, indeed, jump into my mouth. The roasted potatoes served alongside were evil, but luckily they served a controlled number and Ric was kind enough to help me. This is fine dining and the price tag certainly exceeded a pizza night out, but we gladly paid it for a quality Mediterranean meal. Yes, there were some tourists here, after all, it is a stone’s throw from party central in Piazza del Popolo, but there are many locals dining here as well. Including us! Saltimbocca alla Romana with roasted potatoes. Yeah, not on the lo-carb plan, but Ric helped me eat them. Certainly we have to have our greens, too. Cicoria, our favorite Italian veg. Posted by Laurel on August 19, 2016 in 9 points, Rome, The Best! Pasta, pizza, potatoes, bread, and rice are still off the menu for us, so OWP continues to bring you other great Roman restaurants for your vicarious pleasure. This week, we ventured across the Tevere to Siciliainbocca, which means “Sicily in the mouth.” Break it down: Sicilia in Bocca. We loved the food on our trip to Sicilia in 2013, and Siciliainbocca is the closest approximation we have found in Roma. 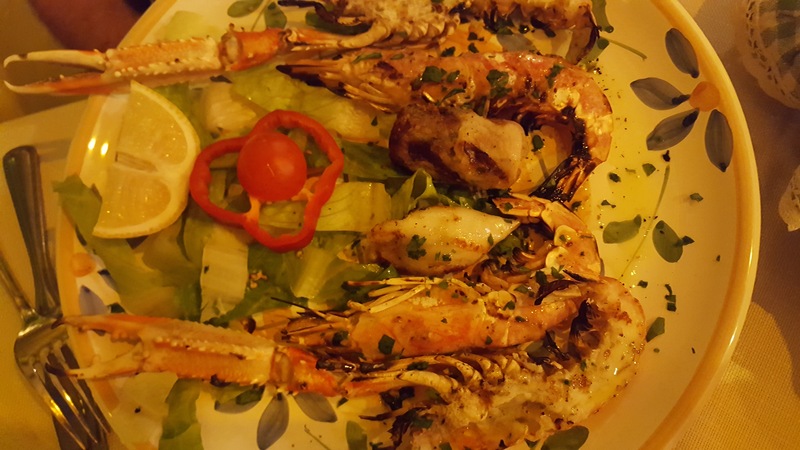 Wonderful fresh fish, delightful Sicilian pasta dishes such as pasta alla Norma, and a broad selection of Sicilian wines, all at what the Italians would call honest prices. (A review on Tripadvisor that says prezzi onesti is quite the praise from a Roman.) And we were able to maintain our lowish-carb diet. A can’t miss it exterior on an obscure street in Prati, Siciliainbocca is a 10-minute walk from our tram. This was our fourth or fifth trip to Siciliainbocca. Mostly we visit as a couple, but one night a few months ago, The Rome Dining Club, consisting of 3 couples from the embassy, enjoyed a convivial meal here. The place attracts a lot of large groups: families out with Nonna as well as groups of friends. Unlike many Roman eateries, it fills up early. By 20:15 on this particular Saturday night the place was half-full while most of Rome was vacant due to the August ferie. 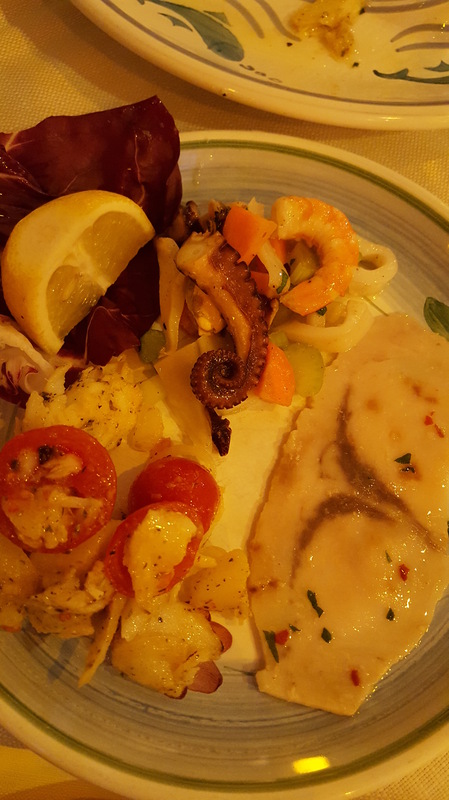 Our mixed seafood antipasto had carpaccio of swordfish, insalata del mare, and more. This is only half of the serving! Plenty for two. I’ll let the pictures speak for the food. The quality is excellent, the pacing perfect. 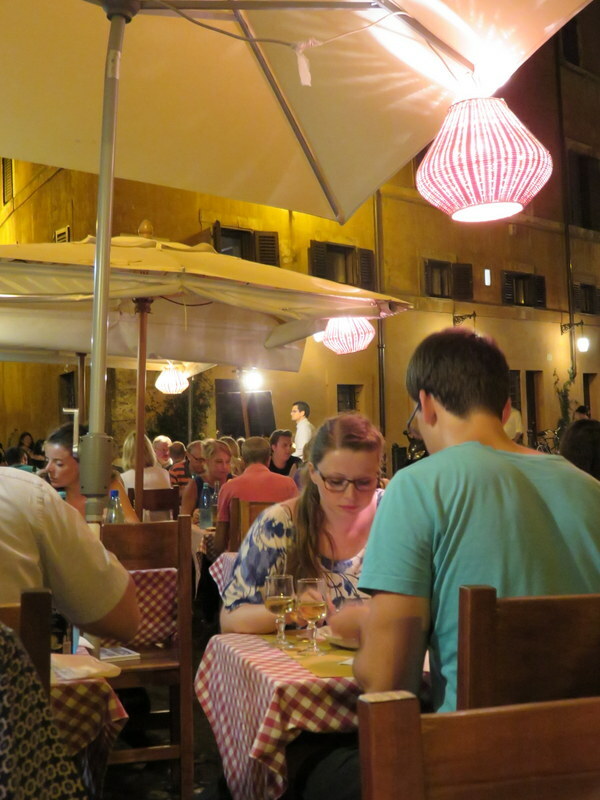 As with any good restaurant in Italy, we owned the table for the evening and could have lingered. 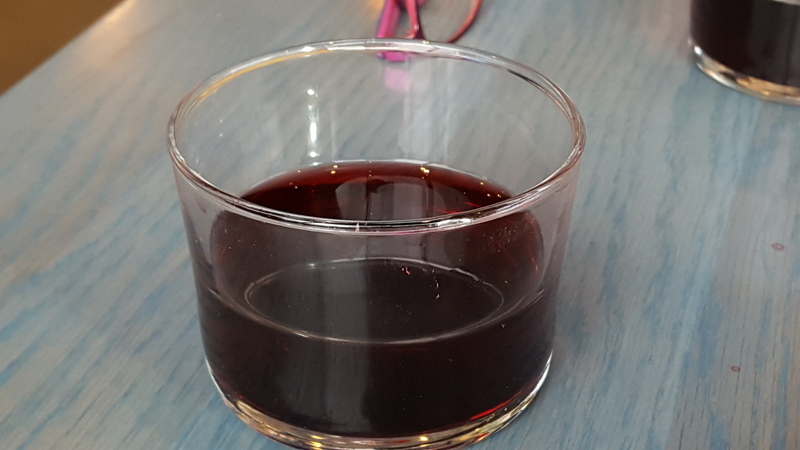 We left not a drop in the bottle of our fine Donna Fugata Anthilia, and a perfect shot of espresso ensured we would stay awake on the tram ride home. Please pardon the yellow tinge to the pictures. I used my phone’s camera and the restaurant itself is so very YELLOW that everything came out looking a bit jaundiced. A very pleasant room, semi-outdoors, tented but brightly lighted. Not exactly designed for romantic trysts. More for dinner with Nonna. A mixed seafood grill for Ric. As usual, the diner has to do some work. I never order shrimp in Italy because I hate that they are presented with shells on. Messy. 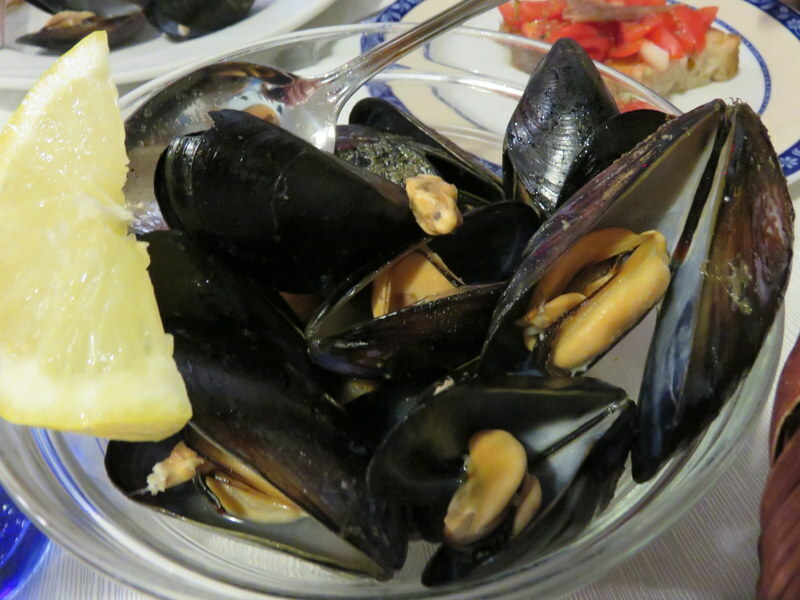 I can eat cozze e vongole (clams and mussels) all night. And did. 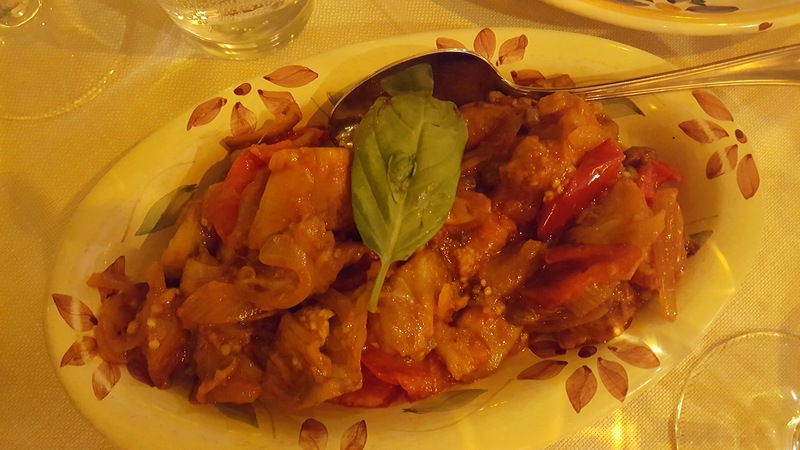 Caponata is a fine Sicilian dish and everyone has a different approach. This is good; Ric’s is better. Posted by Laurel on August 13, 2016 in 10 Points, Rome, The Best! Our Weekly Pizza is going lo-carb. For four weeks we consumed amazing pasta, strudel, and the wonderful bread of the Alto Adige. We were hiking to work it off, but now that we are back in the flatlands of Roma, something had to change for a few weeks. Protein and vegetables are on the menu, along with enough wine and grappa to keep us from wanting to dive off the 3rd-floor terrace. The Captain, Marco, and me. If I look like I’ve had half-a-bottle of Vermentino, it’s because I did. This is, of course, a golden opportunity to fill you in on some other great dining establishments in Roma. As we wind down our time in Italy, we are revisiting places that are special to us, so OWP will take you along for the ride. It will not be forever, this hiatus from pizza. We might make it three or four weeks. 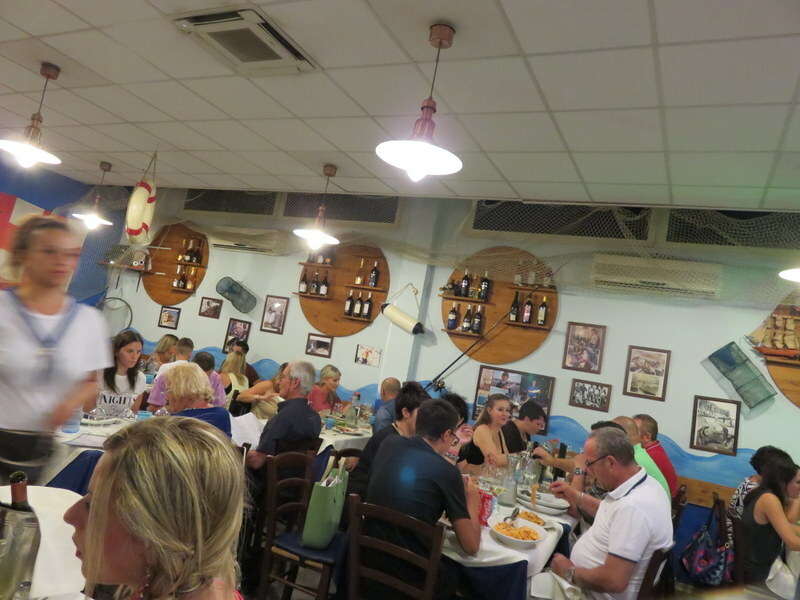 The first week of our self-induced deprivation we took our visiting friend, Zoe, to what is one of our favorite restaurants in Roma: La Fraschetta del Pesce. It is not an easy place to get to as it is far outside the zone tourists frequent, so we hopped in a cab from Piazza Navona with Zoe at a cost of about €15.00. 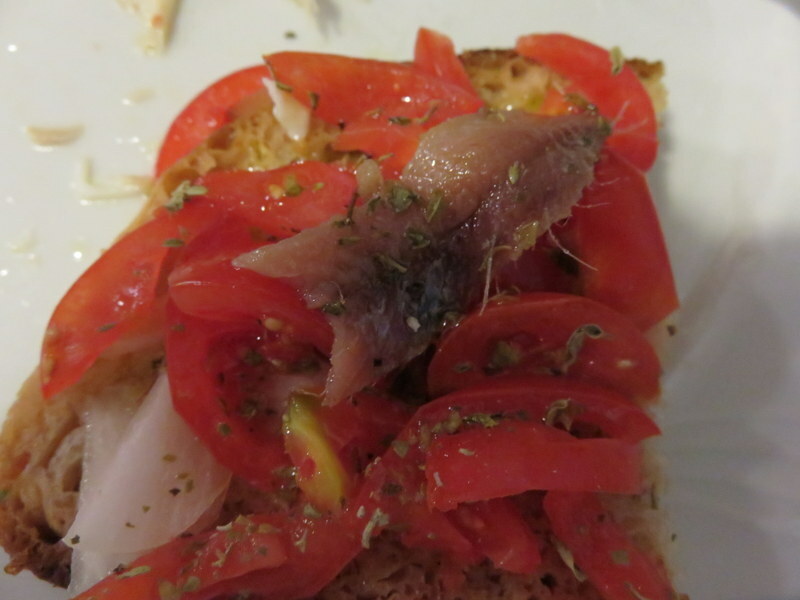 Today with the antipasto, bruschetta taking advantage of abundant summer tomatoes and a bit of fresh anchovy. 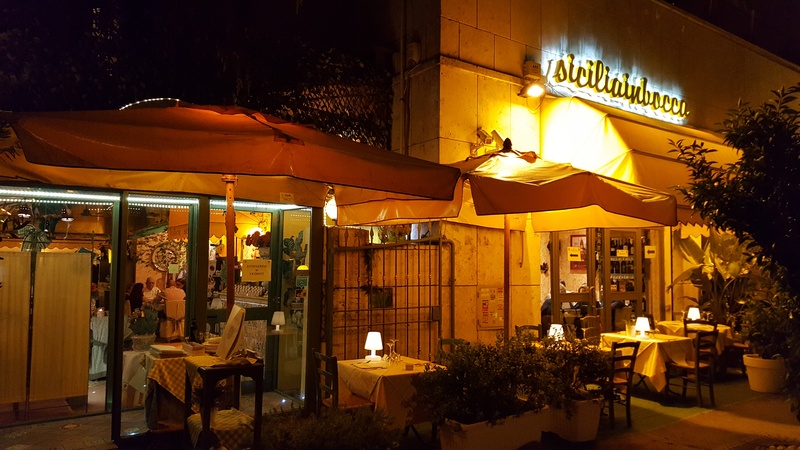 When we first arrived in Roma, Ric found La Fraschetta thanks to a 2012 article in The Guardian: “Where to eat in Rome — by the city’s cabbies.” This list has led us to some terrific venues and great meals, and one clinker. But I digress. We have been dining with Il Comandante (Captain) — Marco Magliozzi — for 4 years, and we cannot get enough of it. 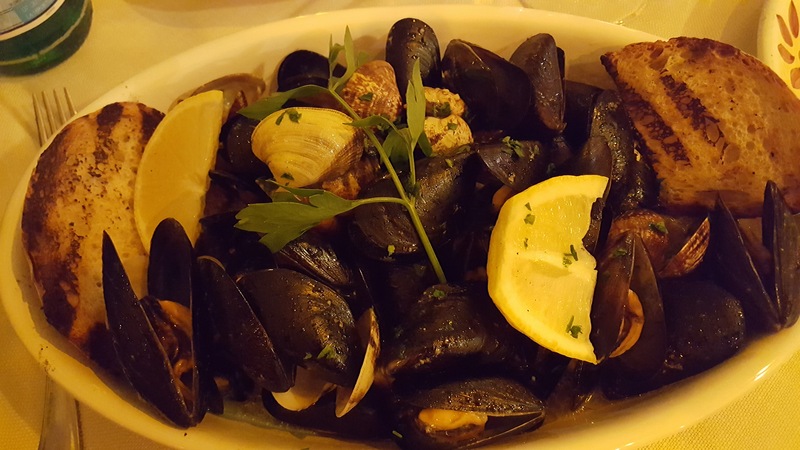 Mussels — or cozze — plump and delicious. I could eat these all night. The first time we visited, my Italian was not very good but we struggled through with the non-English-speaking owner and staff. At the end of our meal, Marco came and knelt by the table. “Come ci avete trovato?” (How did you find us?) Although he was pleased by the answer, he certainly does not need to promote: his place is full every night. People without reservations are turned away at the door. By now, when I call to reserve, he recognizes my voice and we are warmly welcomed as regulars, although we only make it here 4 or 5 times a year. 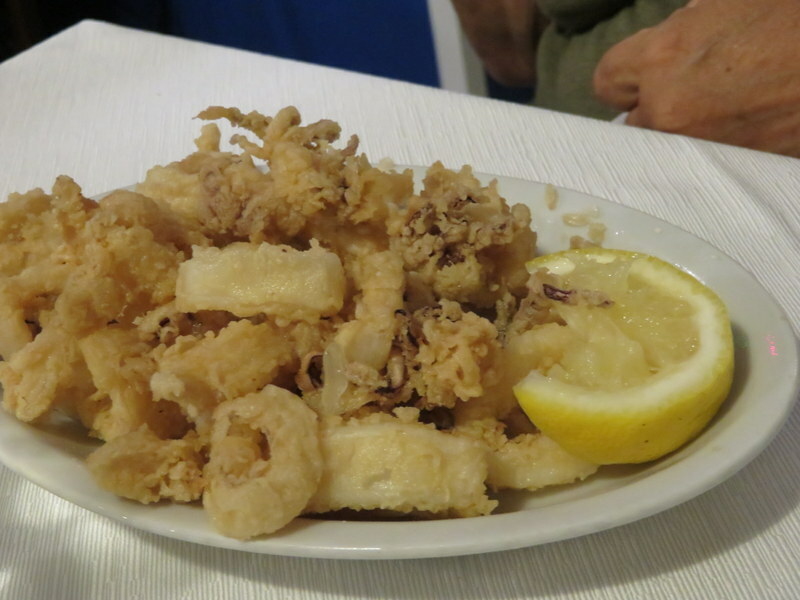 Calamari alla piastra, or grilled calamari, another favorite. Marco used to be a fisherman and has owned fish stores. Now his son does the fishing out of Anzio and everything is fresh and simply prepared. The staff is well-trained and operates with little direction from Marco. Marco takes every order personally, but the guys and gals in sailor shirts deliver the goods. And it comes out fast! Zoe’s calamari fritti. Not greasy, not previously frozen. Made fresh daily. We always start with the Antipasto al Portodanzese a reference to the provenance of the products, Anzio. This spread for two people could be called dinner. (With Zoe along, we let Il Comandante talk us into two portions. Error!) Dish after dish of beautiful seafood arrived: Huge bowls of mussels steamed in white wine and herbs, fried calamari, fresh alici, fried shrimp, bruschetta with alici, and sometimes more. Sometimes things I don’t recognize, but it is all delicious. A server is a blur as she careens through the restaurant, delivering great seafood. A few years ago we realized it was best to have either a pasta or a secondo. Even sharing a pasta was too much, so we go right to the main dishes: grilled calamaro for Ric and grilled tonno for me. These are best washed down with a crisp Vermentino and usually accompanied by Ric’s favorite veg, cicoria ripassata, a bitter green sauteed with garlic and red pepper flakes. God we are going to miss this stuff when we come back the U.S! Where are we going to find field-grown chicory? Spinach is a reasonable substitute, but not the same. Certain of your understanding in advance, thank you, Dear Clientele. It seems he had some poorly behaved parents who let their little monsters run around the restaurant, tripping servers and generally causing an unpleasant experience, so he put an end to it: no small children, strollers, nor highchairs. Lots of press coverage, an example here from the British press, and allegations that it is illegal to exclude children, but we have not seen any young ones there and the notice persists. Personally, I love it. I did not discover the tuna until about 15 months ago. Now I order it every time. Done to perfection! No pizza on this menu, although as you can see we snuck some carbs in courtesy of breading on the calamari. But no dessert and no pasta! Dinner for three with wine and water, the giant antipasto, three secondi, and cicoria was €82.00. We’d easily pay that for two of us in the center of Rome, and often more. It’s worth the taxi fare. FYI, the address in The Guardian article from 2012 is incorrect. When you go, check the website and be sure to call for a reservation. Tell Il Comandante that the Bartons sent you. Ahhh, Rossini, you are good to come home to! I have not written about Taverna Rossini in over a year. I think we had come to take it for granted as it is close to home and the only secret to getting a table is to call 2 or 3 hours before you want to dine. Ric’s pizza Romana with anchovies, capers, and olives. Very much a standard in Italy. Rossini is a huge and varied restaurant that still manages to feel like a neighborhood place. 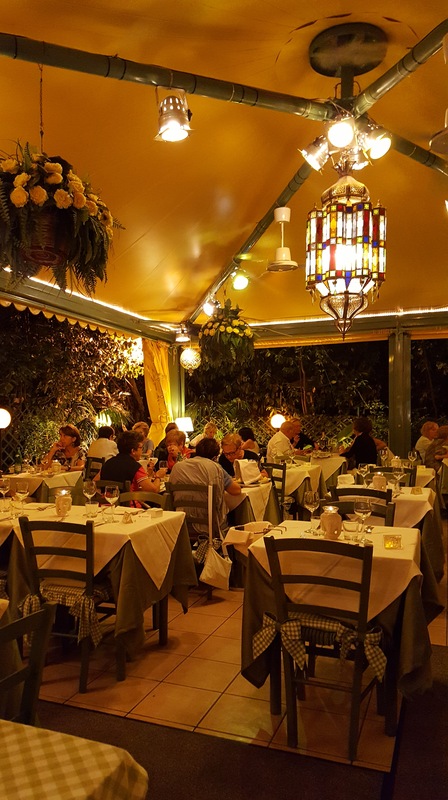 The wait staff recognizes us regulars, it is a 15-minute walk from home which is just about perfect (not too close), they have a wonderful outdoor dining area and a robust menu. 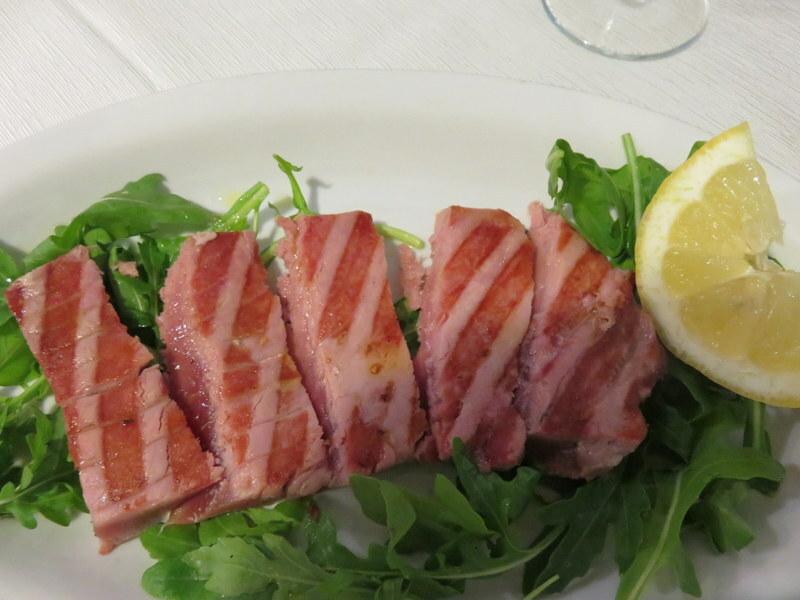 There are three distinct sections to Rossini: a coffee bar, a pizzeria/taverna, and a ristorante/pescheria where they serve up beautiful fish in an elegant atmosphere. It is all inter-connected and the whole menu available in any section. 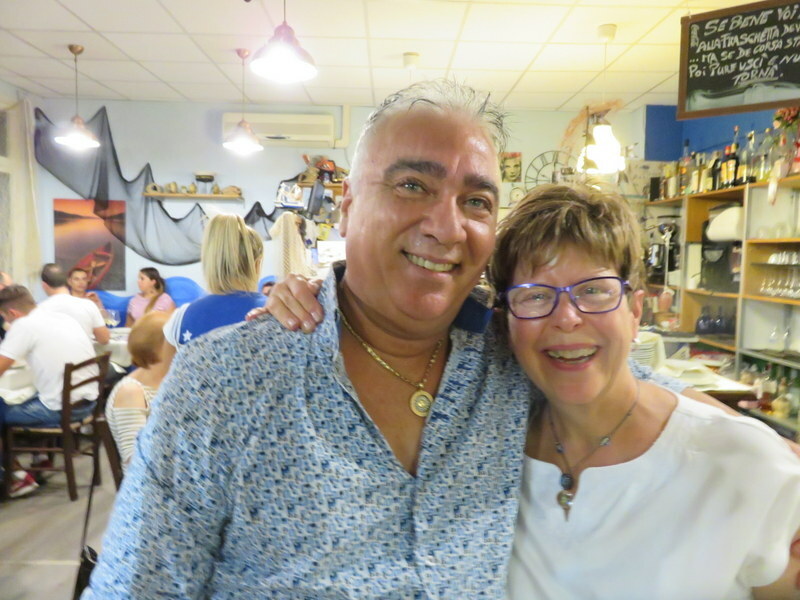 The owner, Filippo Corvisieri, has a brilliant concept, serving cornetto e caffè in the morning, sandwiches from the bar as well as complete lunches in the taverna, and pulling out the stops in the evening, where the pescheria becomes a bit more elegant and romantic. The non-stop, Noon-2:00AM service is extraordinary. Want pizza at 4:00PM? You can have it! My pizza Napoli with anchovies. 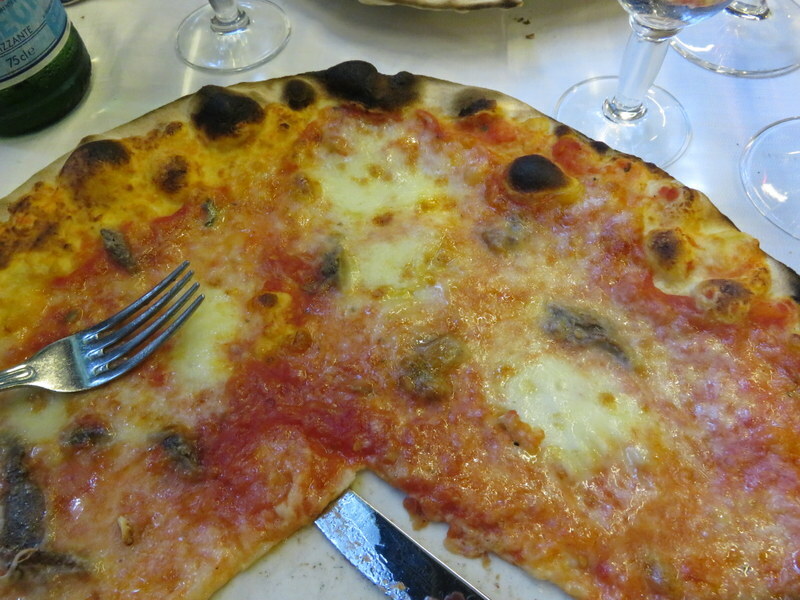 I have come to love the simplicity of Italian pizza and Napoli is my go-to. Pizza is almost always our focus, and once again Rossini delivered, our first night back from our month in the Dolomites. We actually read the menu for a change and discovered a new treat: eggplant “meat”balls. (They sound better in Italian: polpettine di melanzane.) This was our starter, as though we really needed one. Our pizzas were good, as always. 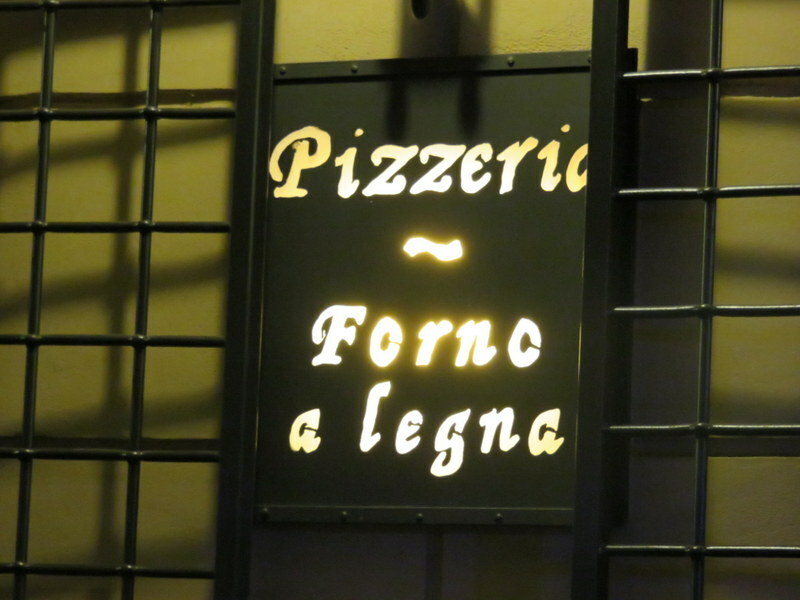 Is it the best pizza in Rome? No, I still reserve that for Dar Poeta, Da Remo and La Pratolina. Rossini is a package. Location, service, selection, ambiance. There is something for everyone here. And try to save room for dessert. 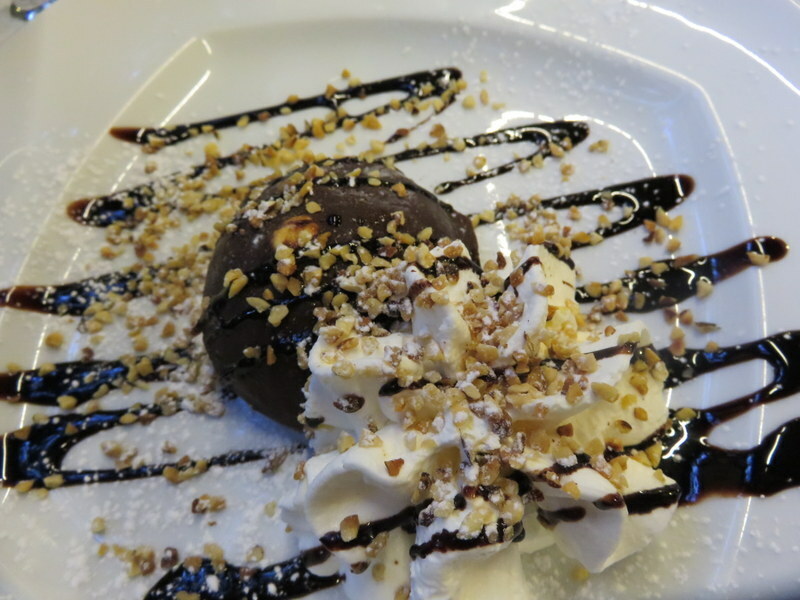 The palle di cioccolato (not on the menu; you have to ask for them) are to die for. Palle di cioccolato: Nutella gelato encased in hard, dark chocolate, dressed with chopped walnuts, chocolate sauce, and whipped cream. One order has 2 palle, and is plenty to share. Pizza Quality: 2 I cannot give this a 3, try as I might. It is good pizza, it is just not the very best I have ever had. But it is really good! Service: 3 The wait staff is like a well-oiled machine. They put up with my Italian, but we hear them speaking English to the tourists. In true Italian fashion, no one expects a tip. Ambiance: 3 The dining rooms are designed in such a way as to provide intimacy despite the size of the place. The outdoor area is open year ’round and is our favorite part of the restaurant. Bonus: 1 Extra credit for great fritti, great dolce, and the outdoor space. Returnability: Go-to Place that borders on worth-a-trip-across-town. If you can hop on a Tram 19 or Tram 3, you will be dropped at the door. Why not go? 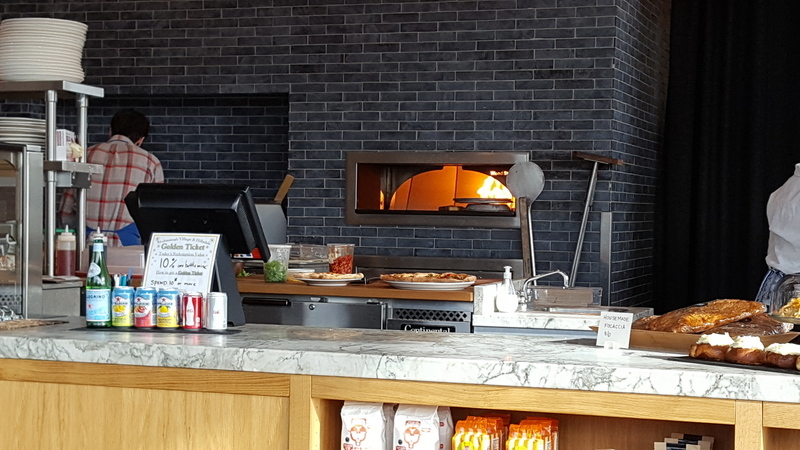 Sign of quality: a wood-fired oven. Outdoors at Rossini on Friday night. It is packed by 9;00PM. 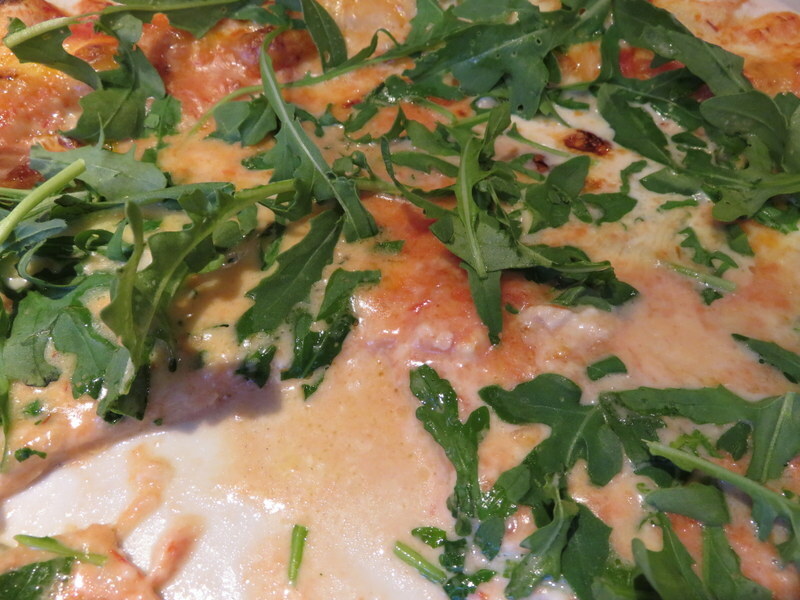 The best pizza in Ortisei in the Val Gardena is…in Santa Cristina. Spending a full month in this delightful mountain valley afforded us the opportunity to get out of Ortisei and try pizza in neighboring Santa Cristina. Lucky we did because we found a mighty fine pie, worthy of OWP praise. Pizza Golosona: spicy salami, fresh tomatoes, brie, mushrooms, raddicchio, tomato and mozzarella. So good we ordered it both weeks. 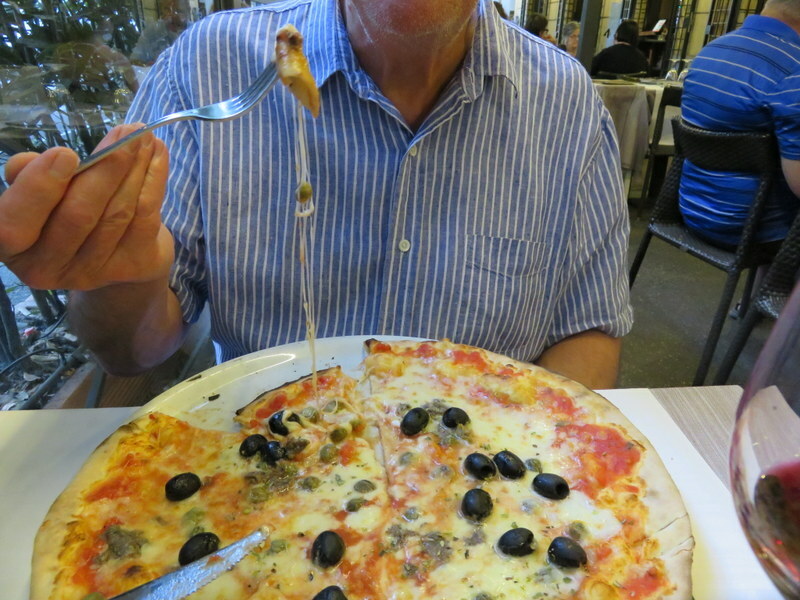 In four weeks we dined in three pizzerias: La Tambra in Santa Cristina, Mauriz Keller in Ortisei, and Cascade also in Ortisei. We have eaten at Mauriz Keller at least once each summer since 2012, so have some depth of experience there. Let’s go right to the summaries and pictures of these three options. 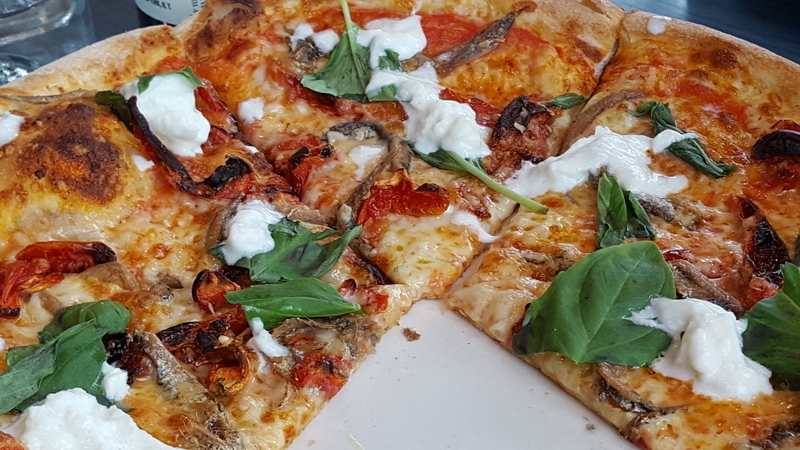 Pizza Quality: 3 Unique offerings, such as the Golosona with spicy salami, fresh tomatoes, brie, mushrooms, radicchio, pancetta, and mozzarella. It was swoon-worthy. Excellent crust from a wood-fired oven. It is right up there with our favorites in Roma. Great selection of local wines, too. Try the very affordable house Lagrein. Service: 3 Efficient, friendly, multi-lingual. They remembered us from one week to the next, which always amazes me. You can reserve online on their website. It is popular for a reason, so do take the time to reserve. Ambiance: 3 The decor is Tyrolean. It is warm and woody, a place you want to linger. It is also a family place and attracts parties of 6 to 8 people, so it can get a bit noisy, but not raucous. The outside deck was delightful on our first visit, but a cold snap caused us to dine indoors the second time. La Tambra has an extensive menu beyond pizza and we saw some amazing meat dishes and pastas coming out. Returnability: The Best! 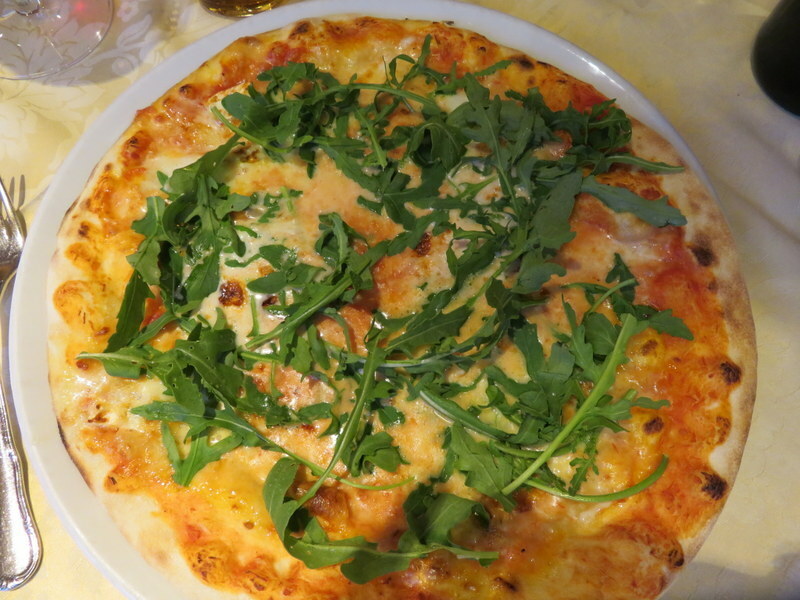 If you are in any of the three little towns of the Val Gardena, make one night pizza night at La Tambra. Click any photo for more of La Tambra. A wood-fired oven is a must for authenticity. Pizza Zio Alfonso: zucchini, corn, peas, walnuts, mushrooms, prosciutto, tomato and mozzarella. This little guy is Samuele and he was a perfect dining neighbor. He was dressed in the stars and stripes and he was quiet. This little guy was a very good dining companion, too. Lovely terrace overlooking the pedestrian area with NO CARS whizzing by. La Tambra interior, Tyrolean warmth all around. Pizza Zingara with prosciutto, artichokes, spicy salami and mushrooms. Mozzarella and tomato, of course! In German…remember where we are. 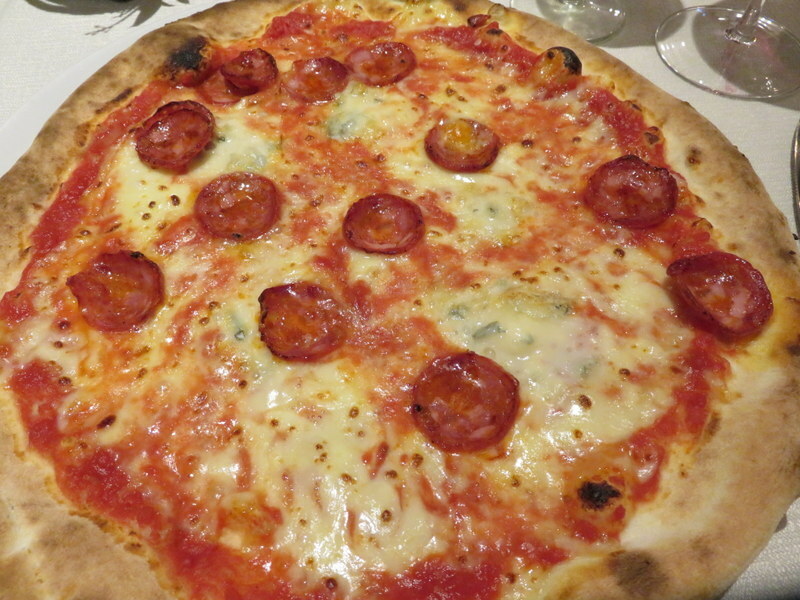 Spicy salame and red peppers, a classic Pizza Diavolo with good mozzarella and tomato sauce. Pizza Quality: 2 Good pizza, wood-fired of course, classic ingredients without a lot of creativity. The crust stands up to the toppings but there’s nothing particularly spectacular about it. Ingredients are fresh and over the many years we’ve eaten here, it is consistent. Service: 3 Efficient, friendly, and like every restaurant here, multi-lingual. 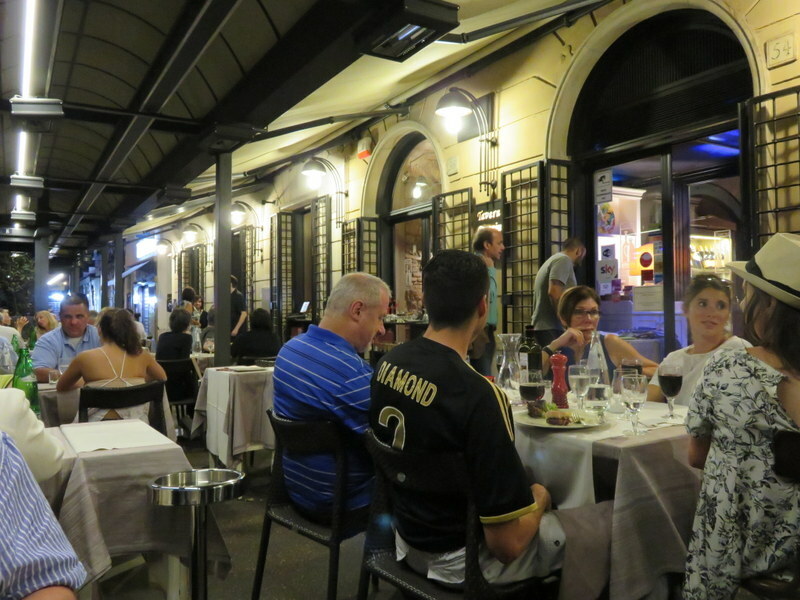 Mauriz seems to be ever-present assuring satisfaction with both regular locals and the many tourists who dine there. You can reserve online through Trip Advisor and The Fork. Ambiance: 2 Great Tyrolean-themed somewhat subterranean. The warm and cozy atmosphere belies the size of the place. One point deducted for no outdoor seating. The menu at Mauriz Keller is huge and having dined there several times, I can vouch for the quality of the pasta as well. Good wine list, but the house wine is fine, too. A few more photos of what to expect at Mauriz Keller. You enter Mauriz Keller via a stairway from main street, or down a quiet alley to this cozy entry. Mauriz himself waits on tables. The vaulted rooms give a sense of openness in the subterranean space. I cannot remember the name of my pizza! Spicy salame, mushrooms, peppers, and onions. 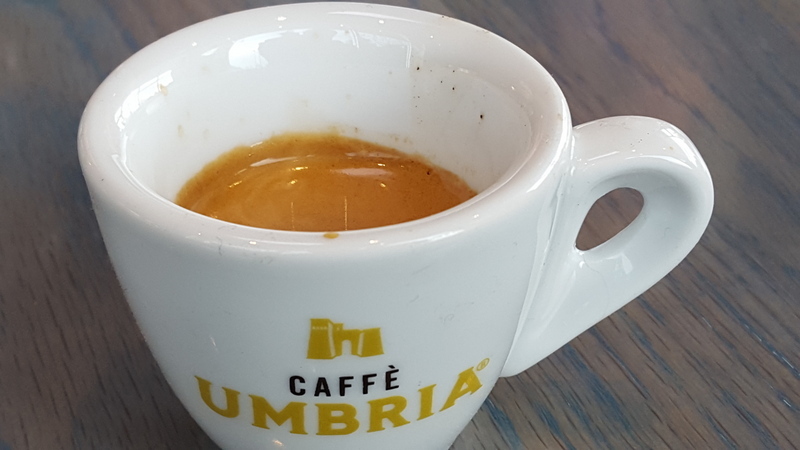 Not really a classic in Italy but tasty. This is another place we have patronized several times over the years. Service is always slow, but the food has been good. Our first meal here was in 2012. I had grilled vegetables with warm camembert. Yum! We’ve had a couple of other meals here over the years and other than slow service, thought it was fine so we decided to try their pizza this time. Error. …until I cut into it and it left a puddle on the plate. 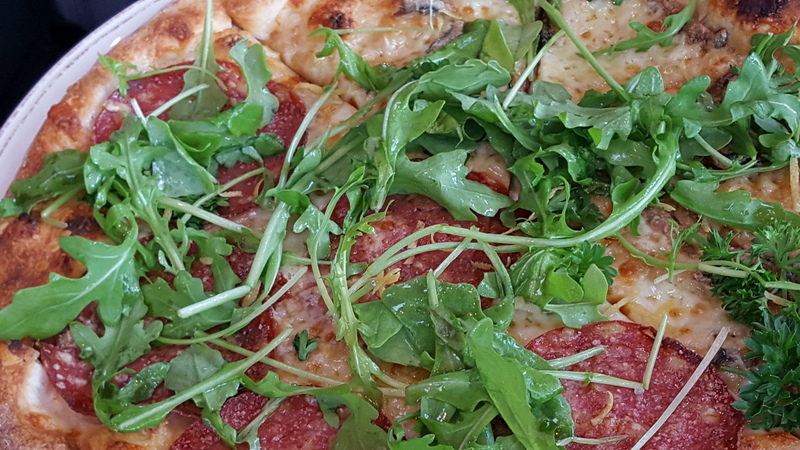 Arugula was raw as it should be. undercooking was the problem. Tomato sauce on both pies was negligible and tasteless. Other than Ric’s venison sausage, there was little flavor anywhere. Service: 2 Slow. Very slow. Just like the last 3 times we’ve eaten there. At least we got in as we had a reservation. Ambiance: 2 Like every place here, it is Tyrolean-themed. The space is divided in such a way that it does not get loud and seems more intimate. A few tables outdoors, although a more attractive option during the day. To top it all off, Cascade is expensive. Returnability: DNR – Do not return under any circumstances. Mistakes were made; do not compound them. Ric’s pizza cervo, with venison sausage. Tasty, not soggy. This little girl seemed to be enjoying her pizza. Not a great shot, sorry. It’s a nice interior with a central bar. Always busy at dinner.